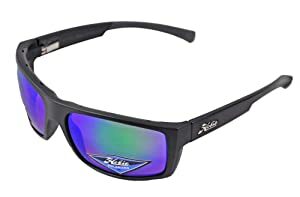 Best Fishing Sunglasses 2019 - Polarized Sunglasses Make a Difference? 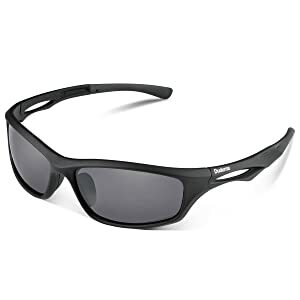 Best Fishing Sunglasses 2019 – Polarized Sunglasses Make a Difference? As a fisher, you must be spending a lot of time out in the water patiently waiting for your next catch: Small or big. Your eyes become your most important ally when scanning the vast water for the slightest fish motion in the water. On a clear day, when you do your fishing, harsh rays reflect off the water and directly onto your eyes. These rays make you partially blind, ridding you of your most important asset. To stay ahead of the game, you need the best fishing sunglasses to absorb the reflected rays and filter out certain light from the sun. This ups your fishing game to a whole new level. You are then able to spot the fish below the water effortlessly, and it won’t see the hook coming. 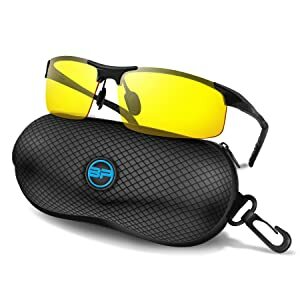 As you look to buy new sunglasses or make an upgrade on your current one, you need to be fully aware of everything regarding fishing sunglasses. This article will provide you with a breakdown of this essential fisherman arsenal. It is very probable that you have heard of the term polarized sunglasses before. You could have even used one at some point. Have you ever wondered what they are and how they work? These sunglasses are quite intriguing in the manner in which they work. Light has an annoying characteristic of scattering in all directions. When the scattered light is reflected from a flat surface, it then travels in a more unified direction (mostly it is horizontal). The horizontal travel of light increases its intensity, causing what is called glare. It is this glare that reduces your visibility into the open waters. Polarized sunglasses create a workaround this problem by having a chemical applied to them that filters the incoming light before it reaches your eyes. This chemical creates horizontal openings on the lenses for light to pass through. This, therefore, means that only the light that approaches your eyes horizontally fits through these openings. All the vertical rays of light or those coming from any other direction bouncing off the water surface will be blocked. The net effect is a clearer and darker image with more details. The objects in view are crispier and easier to see. Polarized glasses, therefore, reduce the strain on your eyes as you battle glare. Fishermen (persons) find these useful since it enables them to see into the water. There is a common mistake among fishermen of thinking that tinted sunglasses are polarized and vice versa. This is however not true. Tinted sunglasses only serve to reduce the brightness of light reaching your eyes, but not the glare, which is done by polarized sunglasses. Now that we have established that polarized sunglasses are good for fishing, what about the non-polarized ones? You might ask yourself if one is good, then should you automatically disqualify the other? When choosing the best fishing sunglasses, should you choose the polarized or the non-polarized sunglasses? It does not always mean that non-polarized sunglasses will not protect your eyes; that is victimization. They will definitely do since their dark shade reduces the intensity of light. However, what they do not do is counteract the effects of glare. This is their main undoing and is the reason why you are not advised to use one when going fishing. In fact, these lenses have no consideration of the direction of light. This inability works against you when you are out fishing. However, many polarized sunglasses are the types loved by most fishers; they too have their fair share of advantages and disadvantages. I must admit the pros are weightier than the cons. 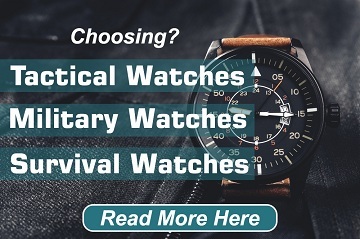 All these cons are mostly not concerned with fishing, maybe only when you want to read from your watch. So in as far as fishers are concerned, the polarized sunglasses will just do. From the above descriptions, it is much clearer that you are better off with a polarized sunglass than a non-polarized one. That is if you want to go back with the most fish catch. The benefits you would get in turn will, therefore, outweigh the initial cost. Every angler deserves the best polarized sunglasses. It gives you a peripheral protection from the sun, enabling you to tackle the various sunny conditions while offshore. Selecting one is, however, another problem altogether. It might seem pretty easy, but it is not. There are several factors that you need to put into consideration since the best sunglasses have features that make them the best. Here are some of the features that will aid you to choose the best of the very best. When selecting a polarized sunglass, the frame plays a critical role in how effective it will be in serving you. There are various styles of frames that you can find in the market, but not all will work for you. They differ in terms of frame material, flexibility, slip and non-slip. As an angler who is in constant motion, a non-slip frame will make the best choice for you. These types of frames keep the lenses from sliding off your face when you suddenly swerve your head. The best sunglass has a frame that snug fits on your face and not too tight at the edges. Guys will also prefer the type that has a hugging fit and an adjustable nose pad. Nose pads reduce the strain you feel on your nose as well as preventing it from sliding when you sweat in the heat. The material the lens is made from plays another role in determining whether it is the best or not. Basically, there exist two types of materials used in making polarized fishing sunglasses; glass and plastic. The plastic made lenses are the dominant material when it comes to sunglasses. The plastic mostly used is polycarbonate. They are lighter than glass lenses and offer more precision. Polycarbonate has only one drawback, and this is their susceptibility to scratching. However, with advancement in technology, coating materials have been used to make the lens less easy to scratch. Then there are glass lenses. Slightly heavier than plastic, but are more scratch resistant than their counterparts. Glass has its drawback too. It shatters easily when dropped. If you are looking for the best, there are polyurethane lenses. These types are very expensive but eliminate the drawback of both the polycarbonate and glass lenses. Light, scratch resistant, does not shatter and more durable. You will have to dig deeper into your pockets though for this luxury. Polarized sunglasses will not be available in a single lens color. There are many versatile colors in existence. Most of the anglers choose the color that they like most. 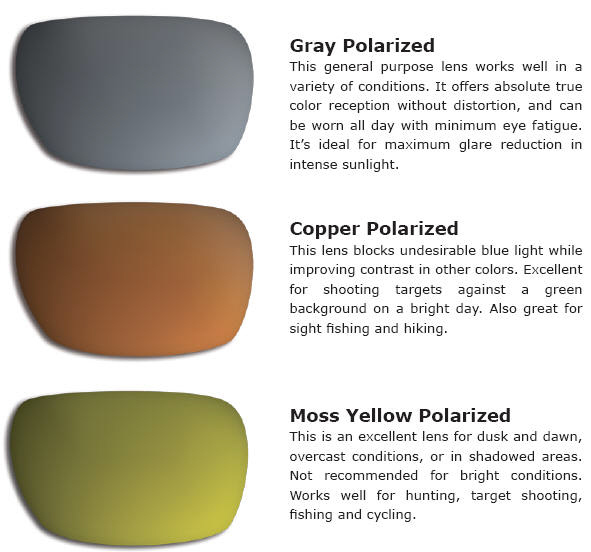 While this is still allowable, how about you choose the lens color based on your favorite fishing spot? After all, you have one, right? The light conditions in your spot demand certain color to bring the best out of your skills. Take an example of a grey lens. It will provide an enhanced vision when in deep water and broad daylight. How about copper lenses to filter out the blue light so that you can catch more colored fish? Or yellow shades for a dimly lit fishing spot? This normally happens during sunset. So, figure out the nature of your favorite spot and choose the best color that goes with it. The best sunglass provides a particular coating to enable it to achieve the desired property. You will have to fork out more cash to get these types though. There are lenses which have a hydrophobic coating to prevent your vision from blurring when water droplets fall on them. Then, there are others with chemical coatings to provide proofing against fog. This is usable in more humid and rainy conditions without blocking your vision. Higher polarization and optical technology are used on certain glass lenses to keep UV rays from your eyes. These are a special type of glasses that allows you to do your fishing for the whole day: from dawn to dusk. These types are flexible and very robust in that they adapt to the various lighting conditions as the day progresses. You remain unaffected in any way. Better still, they can offer protection from UV rays and sharp glares from the sun. Designed to meet all your fishing needs, this sunglass is made from Techlite glass. This type of lens is essential as you need optimum clarity while going about your fishing. The glare from the sun can sometimes ruin how much catch you take home as you do not see clearly. Taper Lens Technology (TLT) used to make the lenses is what provides for the eyesight rid of distortions. Another feature you can look forward to is the scratch resistance of the lenses (approx. 12 times standard lenses) and the ultra-light design. The polarization is precisely engineered to eliminate glare. This technique is useful when dealing with glare on surfaces such as water, snow or asphalt. The polarized visual layer is precisely layered within the lens to filter out 99.9% of glare. “The objects in the lens are exactly as they appear.” Tapered Lens Technology (TLT) is employed to make this a reality and avoid refraction of light that causes deformations in the images that appear. This leads to an end result of accurate images that are comfortable to the eye. This polarized sunglass has a lens with an optimized peripheral vision. Aside protection for the 6-base lens curvature is also provided. These are features that work to ensure you have a durable sunglass with much clearer images. The lenses meet and exceed Z87.1 optical and basic impact standards. An assured impact resistance is hence guaranteed. The plutonite material is included in the lenses to provide 100% protection from UVA, UVB, UVC and any blue light with wavelengths up to 400nm that could be harmful. The use of a stress-resistant O matter material enables durability of the frame while remaining lightweight and comfortable. These long-lasting materials hold the polycarbonate lens in place and perfect alignment. Metal bolts are used to accent the lenses to the frame, further adding to the durability. A combination of technologies is used to produce lenses that give clearer, accurate and sharper vision of the images. These lenses eliminate the occurrence of distortions that are common in high-end sunglasses. In addition, your eyes are protected from objects traveling at various speeds. 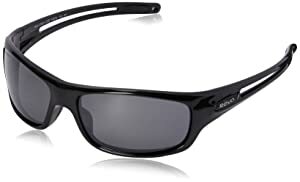 The Hobie Baja Sunglass is among some of the best fishing sunglasses available on the market currently. The frame used to make this sunglass is made from composites. Weight is cut down considerably in the process, while still ensuring the same great strength to last you for a while as you fish. The 1.8 mm borosilicate lenses are lightweight and are resistant to shattering. A Megol co-molded rubbery nose pad is included in the frame to keep the sunglass on you by preventing slippages even when you sweat. When fishing in humid conditions, fog can sometimes occur, thereby inhibiting your vision. The use of a special fog resistant gasket solves this problem. A hydro clean lens coating has been applied to the lenses to make them easy to clean. The sunglass is availed in sizes varying from large to extra-large. You will always feel very comfortable when using this sunglass. A compact construction is engineered to give you a performance you could trust as you fish offshore. The all-terrain purpose build and a sleek fit ensure that it does not come off in any condition that you use it on. Then there is a motion-fit technology that gives optimal comfort in these various environments. This sunglass is fitted with a plastic frame that is both lightweight and durable. This frame holds the polycarbonate polarized lenses that do not shatter like glass lenses do and are also very light. When out in the open on a sunny day, exposing your eyes to UV can be discomforting. That will never be a bother when using this product. A type of coat is used on the lens to absorb 100% of these Ultra Violet Rays. The frame has an elastomeric nose pad which reduces slip, giving a secure fit even when active. A curved fit is designed so that it is relative to your face. A high-performance sunglass that combines an array of technologically advanced features to give you the freedom of just focusing on dragging more fish into your boat. This fishing sunglass uses a polycarbonate and light wave glass to make two sunglasses that you can choose from. Both of these lens materials have their own sets of pros and cons. The glass is thinner and 22% lighter than average polarized glass lenses, besides being scratch proof. Polycarbonate lenses are the lightest, are impact resistant and durable. The frame of this sunglass is made from co-injected bio-based nylon. It is a material that is durable and tough. Besides these features, it is also resistant to both cold and heat. This results in a flexible yet durable frame in a wraparound shape. If you need a sunglass that you can use for more than just fishing, then this could be your choice. Fishing, driving or relaxing on the beach are some of the areas you could use this sunglass. The saltwater safe parts ensure there is no limit to where your imagination can take you. It is designed to be slightly oversized with wide temples for extra comfort plus better protection against weather elements. The shape is a modified rectangle frame which complements a wide range of user’s faces. The SuperThin lenses are about 20% thinner than the conventional laminated glass lens. Non-slip silicone nose pads have been embedded into the design for a more active use without it falling off. A clear shell scratch resistant coating is applied to the lens to shield it from scratches. PolaryzedPlus 2 technology is used to eliminate direct, bounce back or reflective glare. Away from the more expensive sunglasses, here is a cheaper alternative to the high-end sunglasses. This Blupond sunglass has polarized lens that provides 100% UV400 protection. Harmful UVA, UVB and UVC rays are also filtered out and do not reach your eyes. The lenses are 7 layered, containing scratch resistant layers, anti-reflective and polarizing layer, toughness layer, UV absorbing layer, shatterproof layer, and a bend resistant layer. An assured performance is a guarantee with this sunglass. 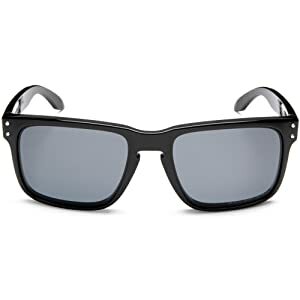 Featuring a universal fit design, this sunglass fits various head sizes and includes a frame made from a special compound of aluminum and magnesium. This makes a very sturdy frame that can resist lots of drops and squashes. Versatility is another feature that this cheap sunglass offers to a whole new level. You can use it for all the various kinds of sporting and outdoor activity, including fishing. Here is yet another excellent member of the best fishing sunglasses. It’s a light, stylish and durable sunglass for all your fishing needs. A polycarbonate material is used in the construction of the frame. This method is used to produce a much stronger sunglass. 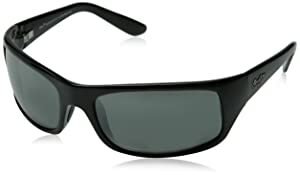 The 7-layered polarized lens uses advanced technologies to keep it from peeling off. Polycarbonate is used to make the lenses for a durable and scratch resistant result. These lenses are then coated to offer 100% UV400 protection and block 100% UVA and UVB rays. It is a multi-gender use sunglass for both men and women. The good thing about the Duduma Polarized sunglass is that you can afford it because it comes at a relatively lower price. It will also snug fit almost all faces to make sure that you are comfortable when using it during your fishing spree. What’s more, this sunglass is also very stylish despite being cheap. 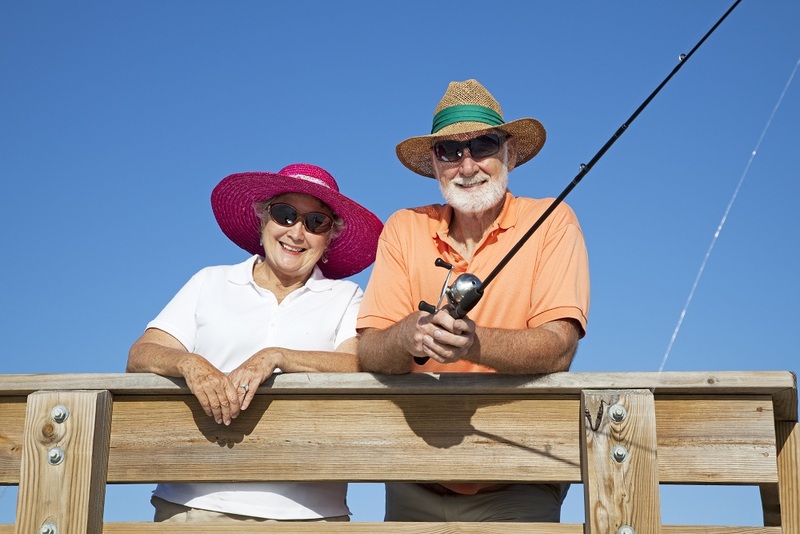 Sunglasses form a very important part of your fishing gear. There are a lot of sunglasses that you can choose to accompany you on your fishing trips. The best fishing sunglasses that you choose should be a snug fit, non-slip and polarized of course. 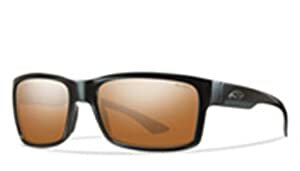 All the features you would look for in a fishing sunglass have been provided in this article. This gives you a peace of mind while keeping you comfortable as you do your thing. We hope you have enjoyed reading this article and it has been of much help in deciding on which sunglass to go for. Do you have any questions? Suggestions? Comments? Just hit us in the comments box below and we will get back to you. I don’t know how to say thank you for your valuable information about fishing sunglasses. You Know what your blog is really helping me to find fishing sunglasses. Thank very much Please keep the good work. Every angler knows a great pair of fishing sunglasses is an essential accessory to make a great catch. Premium, color-enhancing polarized fishing sunglasses from sunglasses eliminate glare from the water’s surface revealing vivid, high-contrast color to the depths below. It’s essential for every fisherman to have the proper eyewear to protect their eyes against UV and to maximize their performance. When the suns reflection bounces off the water it creates a harsh glare that will hinder your vision and make it difficult to track the fish. Polarized lenses will cut out any undesirable glare, so you aren’t forced to be squinting and cause extra eyestrain to yourself.